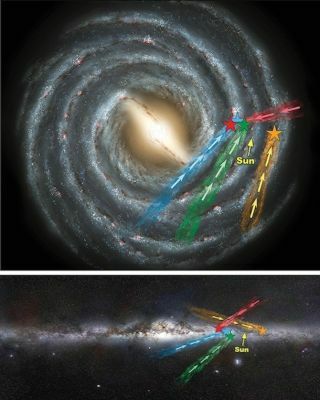 Top and side views show four of the new class of stars traveling fast enough to leave the gravitational grasp of the Milky Way. A new class of fast-moving stars are on their way out of the Milky Way, scientists say. Unlike most other known hypervelocity stars, the 20 sunsize stars are not exiting after interacting with the black hole in the heart of the galaxy, a massive body whose gravitational influence usually provides the kick needed to escape, the new study found. "The original hypervelocity stars are large, blue stars, and appear to have originated from the galactic center," Palladino added. "Our new stars are relatively small — about the size of the sun — and the surprising part is that none of them appear to have come from the galactic core." Palladino discovered 20 potential hypervelocity stars while using a massive stellar census, the Sloan Digital Sky Survey, to map the path of sunlike stars in the Milky Way. Leaving the galaxy takes a phenomenal amount of energy. Stars must reach speeds 1 million mph (1.6 million km/h) faster than the 600,000 mph (970,000 km/h) at which objects already speed around the Milky Way. Most hypervelocity stars were once part of a binary pair that strayed too close to the supermassive black hole at the center of the galaxy. As one star spirals inward toward the black hole, the other is flung outward, fast enough to leave the galaxy. Scientists have discovered 18 giant blue stars on their way out that could have traveled such a route. "It's very hard to kick a star out of the galaxy," collaborator Kelly Holley-Bockelman, also of Vanderbilt, said in the statement. The team presented their newly discovered class of stars at the American Astronomical Society meeting in Washington, D.C., earlier this month. The results were published in the Jan. 1 edition of The Astrophysical Journal. Stars ejected by the black hole have a different composition from that of the newly discovered stars. The 20 new stars have the same makeup as normal disk stars do, so the team doesn't think these newly discovered stars came from the galaxy's core, halo or some other exotic place. "None of these hypervelocity stars come from the center, which implies there is an unexpected new class of hypervelocity star — one with a different ejection mechanism." Precise calculations require measurements taken over decades, so some of the stars may not actually travel as fast as they appear to, Palladrino said. To minimize errors, the team performed several statistical tests. "Although some of our candidates may be flukes, the majority are real," she said. What might have provided the needed galaxy-fleeing kick, however, is still a mystery. "The big question is, what boosted these stars up to such extreme velocities?" Holley-Bockelmann said. "We are working on that now."